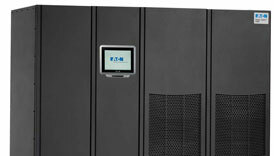 The Eaton PowerXpert 9395 UPS’s (200-1200kW) provide industry-leading efficiency and scalable battery runtimes in a small footprint. Large data centers, healthcare applications, multi-tenant data centers, light industry, and other critical systems can lower their total cost of ownership by leveraging the ground-breaking Energy Saver System. Monitor and manage your Power Xpert 9395 UPS with the 10-inch color LCD touch screen display. Eaton’s ESS mode of operation allows the 9395 to provide 99 percent efficiency across the entire operating range, typically down to 20 percent. For UPSs that are often under-loaded because of redundancy requirements or oversizing, TCO is reduced no matter how much of the data center is being used. The Eaton 9395 is available with optional Lithium-Ion Batteries. Li-Ion Batteries can be the perfect choice for your three phase UPS and offer several advantages over traditional valve-regulated, lead acid batteries commonly used in UPSs today. Click here for more information on comparing Li-Ion to VRLA batteries. For more in-depth specifications see the Eaton PowerXpert 9395 200-1200 kVA Spec Sheet. call 800.876.9373 or email sales@power-solutions.com.